Kevin Doherty, Executive Chef for Delaware North Companies Sportservice at TD Garden in Boston, shares his career timeline and advice for up-and-coming talent. Golf Host Resorts, Innisbrook Div. You cannot listen if you are talking. “Yes, chef” is the only answer that matters. The most important thing I learned on my first job was that hard work builds a backbone and teaches you the fundamentals. 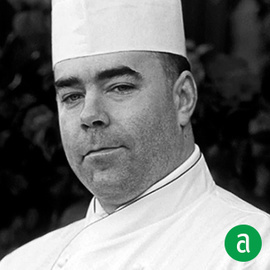 Roland Henin CMC taught me personal integrity and the true passion for cooking. He has helped bring out these qualities in me. He forces you to see what your full potential is. I wish I could have met him 20 years ago! William Coyne CEC taught me respect, understanding, and fairness. My Grandfather, a baker, was my first mentor. He put in hard work and long hours in a hot bakery every day. As a result of that hard work, he learned a great life skill that he truly enjoyed. Setting goals has kept me motivated during those tough times. I set 3, 5 and 10 year goals. Years of practice led to an opportunity to cook at the Culinary Olympics and see what the best in the world have to offer. It was such an honor. I thought to myself, “Wow, I am really here?” Receiving a medal at the end was the start of a new culinary journey that continues to inspire me.